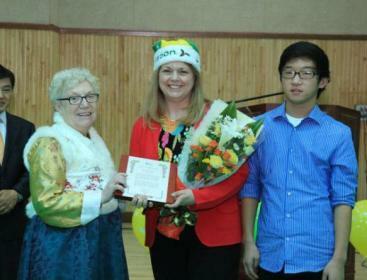 Partager la publication "Last member of Holt dynasty lives up to name"
Molly Holt helps celebrate 50-years of adoption agency’s Ilsan centerILSAN ― She’s known by many names, from the Mother Teresa of Korea to the Mother of all Korea’s Orphans ― and 55 years on she is still living up to them. Molly Holt, chairwoman of Holt Children’s Services, was not only a witness to the nation’s rise from the ashes of the Korean War. Because of her selfless heart, she was knee deep in it. “I kept on delaying my college, because there was so much to do here, so much poverty, so much ignorance and so many babies died,” said Holt, referring to when she first arrived here in 1956. “The Busan city asked me to go to this one orphanage where they had a lot of deaths,” said the daughter of Harry and Bertha Holt, who founded the nation’s largest adoption agency at the time. Armed only with her nursing skills, a pure heart and a selfless will to care for others, Holt simply could not leave the country in need, which is why she decided to spend the rest of her life here. And at the Holt Ilsan Center’s 50-year anniversary on Thursday, volunteers, residents and special adoptee guests recognized how far the organization had come and what Holt has done for it. ← Diner à Nantes le 17 décembre !